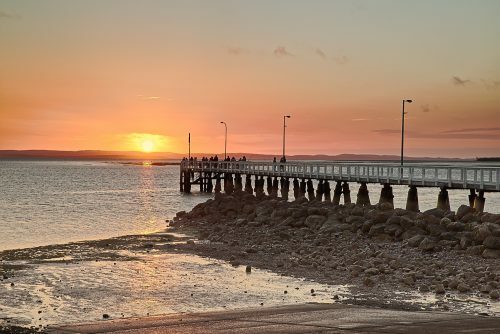 This is Wellington Point in Queensland at sunrise on New Year’s Day 2018. Although the jetty is a popular local photo location, New Year’s Day sunrise is not really the time to take the ‘best’ shot. The jetty and foreshore is often teeming with sightseers and fellow photographers all wanting that first shot of the year. Anyway, this is my attempt. The photo is processed from the camera’s RAW file (a RAW file is the format that is equivalent to a film negative) using a program called Darktable. This is an ‘open source’ and free RAW photo editor that has recently been ported to Windows. Darktable is a wonderful piece of software with a different approach to many RAW editors such as Lightroom (Adobe). I learned to use Darktable when I was using Linux as my operating system for most of last year. At that time Darktable was only available on Linux and on Mac operating systems. Unfortunately, most of my work requires (or is more convenient when using) the Windows operating system, consequently I reloaded Windows on my home computer and stopped using Darktable. With the software now available on Windows, I can now resume using Darktable. Good luck and best wishes to all for 2018. Just for kicks, I decided to upgrade my computer so it can boot into Windows and Linux (Ubuntu). I use Adobe Lightroom for processing my photos under Windows, I wanted to try Darktable which is only available for Mac and Linux. This is my first Darktable edit. It isn’t brilliant but it still looks like the scene I pointed my camera at! The picture is of the first sunrise of the year. In Darktable I used parametric masking – which Lightroom doesn’t do in any great way – to adjust saturation, exposure and contrast. I also used colour reconstruction which is quite good, it allows you to put back colour in areas that are ‘blown out’, for example the disk of the sun.